Six days without post...uf uf...too much. I apologise for delay...last days I'm pretty much short with time. 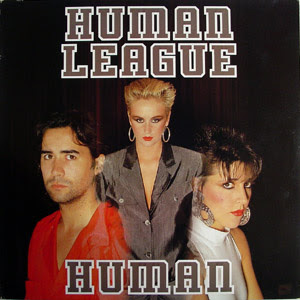 One of my favourite songs from HUMAN LEAGUE for sure is ''Human'', from their 1986 LP ''Crash''. Song was written and produced by...to me NO. 1 producing duo of all times, Jimmy Jam and Terry Lewis. For this crossover I used accapella, instrumental (available on 12'') and album version. Song was published on 7'' single as well. Official 12'' extended ends up at 5:03...this crossover at 8:50. For this crossover I made 2:16 long intro combining acapella with deep drum sounds. In crossover it's integrated and can't be played separately. Here's complete intro. Have fun. Hi, me again, just wanted to add that the 'intro' track has to be the best 2 minutes I have heard for a long time. Fantastic ! Thank you for your kind words Gareth...I really apreciate your comments. It keeps me going further.Regards from Dodi. Very nicely done, Dodi! Human League was such a cool band. 'Human' was the first single from them I owned. Nice long mix. Keep up the good work! Greetings from The Netherlands, Rachel.